Sony's Xperia T goes by a few names. Depending on which country you're in, you might pick it up as the Xperia GX, or possibly even the TX. The final review sample that's been passed our desk, however, is the Xperia T, the European HSPA version, headed to O2's UK stores in the coming weeks, at which point it will be free on £36 per-month contracts and likely replace the Xperia S as Sony's Android flagship. In comparison to Sony's spring smartphone, there's a similar 720p display, now stretched out to 4.6 inches, a different 13-megapixel camera, a new 1.5GHz Snapdragon S4 processor and Android ICS -- with the promise of Jelly Bean soon after it hits store. The Xperia T also revives a familiar hardware curve and has picked up onscreen Android buttons on its design journey. Design twists and promises of the latest OS aside, has Sony finally built a top-tier phone capable of going toe-to-toe with the smartphone heavyweights? Have a look after the break. The Xperia T is a modest improvement over Sony's older phones. It has a great display, but rivals still offer better battery life and higher-quality design. 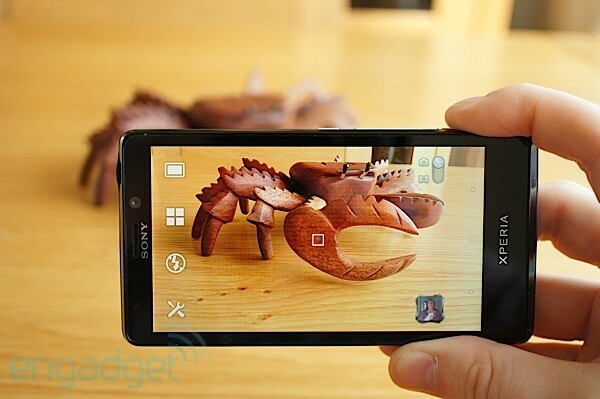 How would you rate the Xperia T? When we were first introduced to it, the Xperia T was shaping up to be a quite the looker, but when we pulled it out of its box, we found it a little bit... underwhelming. It weighs in at 139 grams (about 4.9 ounces), it feels a bit chunky in-hand, and while Sony has perfected the art of the press shot, in real life the hardware doesn't quite cut it. The screen connects to a glossy plastic frame, while the back (and the majority of the sides) have a matte finish. Yep, Sony has continued to skip the glossy finish, and our fingertips couldn't be happier. Due to that Xperia Arc-inspired curvature, the phone is easier to grasp than you might expect from a device packing a 4.6-inch display. The way the screen portion of the side curves back inwards makes it easier to grasp than the smaller Xperia S. While it's been a matter of months since the company's last flagship arrived, button locations and access panels have changed, correcting some criticisms we've had with several of Sony's phones so far this year. First up, those flimsy port covers are gone, with HDMI support now assigned to MHL within the micro-USB socket -- which is also open to the elements. 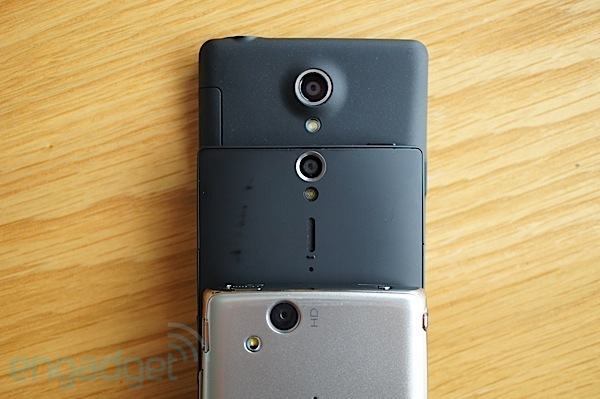 Even on the Xperia S, we never understood why Sony would cover up a port that could be used daily. The buttons have also been transplanted -- all are now located along the right edge. Below the single flush cover for the micro-SIM and microSD cards, there's the power button, volume rocker and two-stage camera button -- all solidly constructed. The camera button requires a gentle touch to focus, while a hard-press will launch the camera app from standby. There's no removable cover, making the phone feel solid in our hands, although perhaps lacking the premium materials of other high-priced rivals. There's a 13-megapixel rear-facing camera, while the front-facing sensor captures 1.3 megapixels, capable of 720p recording. With Sony's Exmor R Sensor, the primary shooter can record up to 1080p video and is accompanied by an LED flash and mono speaker that's inconveniently placed where your fingers are likely to grip the phone. Otherwise, the speaker itself is sufficiently loud, with some distortion at top volume. The Xperia T's NFC credentials mean it can also relinquish audio responsibilities to Sony's recently announced speaker range. If you like what Sony's been offering on the Xperia S and Ion, you'll find the Xperia T performs just as well -- but bigger. At 4.6 inches, coated in scratch-resistant glass, it's designed to plug into Sony's Entertainment hub and all the content it has on offer -- if you're willing to commit to another ecosystem. It's another strong-performing screen -- no AMOLED means less color distortion and no PenTile woes. The viewing angles appear identical to the Xperia S, meaning they're pretty damn good. We'd also like to mention here that those on-screen keys give the Xperia T a far more up-to-date air than its predecessors -- Sony's catching up. The Xperia T comes with a manufacturer-tinged version of Android 4.0 -- Ice Cream Sandwich. 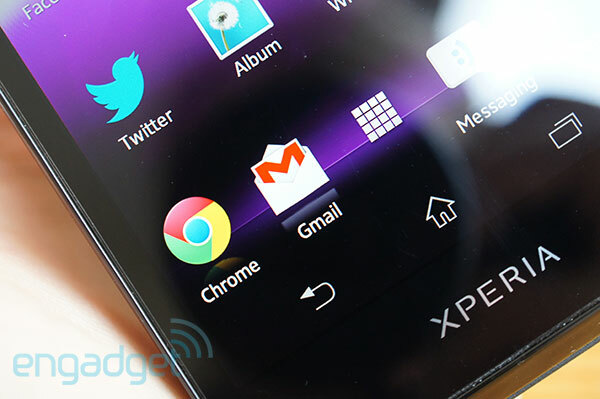 This time around, the phone has onscreen buttons instead of capacitive keys, but on first appearances the UI appears very similar to the Xperia S. This entails a sizable collection of Xperia widgets, with plenty pointing to Sony's homegrown software and services. Extending from a social feed to Music Unlimited, we started to re-purpose those homescreens immediately, clearing out the majority of them. Sony isn't only going up against Google's own content store, but with the likes of Spotify and Amazon, and we're still not seeing much to draw us into yet another ecosystem wanting our credit card digits. There are also a lot of apps packed into the app drawer that are best left untouched. An EA games hub teases the likes of Dead Space and Need For Speed, but after tapping through, you'll be informed that none of the games listed are (currently, at least) supported on the Xperia T. The PlayNow hub does offer compatible games, but the quality will soon push you back to Google's richer games selection. The onscreen multitasking button not only throws up shortcuts to currently running apps, but also shortcuts to calculators, timers and a memo-taking function. Sony's calling these "small apps" and there's a shortcut to install more of them in Google Play -- although there's nothing to download from there yet. For anyone who lives surrounded by Bravia TVs and Sony Blu-ray players, the Media Controller looks like a welcome addition, offering to transfer remote capabilities to your smartphone, although we didn't have a compatible set to put it through its paces. A Movie Studio app comes pre-baked on the Xperia T, offering up some lightweight tools to chop up those home movies, while Smart Connect gives the user a lightweight interpretation of Motorola's Smart Actions -- we took to using the night setting almost immediately. Unlike Smart Actions, these are partially limited by what you can link to the phone; "night" will switch the phone to silent and start up the alarm app when the device is charging and it's some time between 10 PM and 7 AM. These timings can be changed, and you can set other apps to launch when the phone is connected to headsets, chargers and other compatible hardware. But compared to Motorola's attempt, it's all a bit limited. Sony has kept the camera unit recessed, meaning it thankfully dodges hard surfaces and finger smudges. The sensor is a minor bump up from the 12.1-megapixel sensor seen on the Xperia S, but the UI and results are similar. That is, a lot of our shots looked sharp and in focus on the screen but were often mired in noise when it came to focusing in. Low light performance illustrated this much more, but we found our photo files were compressed to the same extent on the S model. You can adjust exposure, ISO, metering and white balance, and even adjust how the settings are displayed in the camera UI. The camera rockets into action from the physical button or even from the lock screen, although you have the option of capturing or focusing from either the touchscreen or the physical controls. The video sample embedded below demonstrates a good autofocus experience, and the image stabilization option does does a good job of mitigating any shakiness. Again, you'll get a very similar experience from Sony's other recent smartphones. That 4.6-inch screen sports an impressive 1,280 x 720 resolution, so we were looking forward to seeing how the Xperia T's 1,850mAh battery handled the workload. In summary, it delivered a middle-of-the-road showing. We got just under six hours of constant video playback, WiFi and 3G enabled regularly polling Twitter and our email. Sure, that's incrementally higher than the Xperia S, but given its non-removable nature, we were never quite confident that the Xperia T would go the distance. With medium to heavy use, we managed about a full work day, but we'd advise carrying either an external battery or a USB cable if you're going to work overtime. The Xperia T totes a pentaband GSM radio. Through a HSPA+ connection on Three UK, we were hitting speeds of around 6 Mbps down and just under 2 Mbps up -- comparable to other phones we tested nearby. Call quality was also strong -- a plus on occasions when you find yourself using those free minutes. The 1GB of memory directly matches the Xperia S -- as does the most recent Android build (4.0.4) but undulations between the UI mean there are at least some minor software differences. We updated our Xperia S scores here to reflect its Android 4.0 refresh, but the Xperia T still dominates in these tests, with the Snapdragon S4 processor predictably besting its S3 relative, despite the same 1.5GHz clockspeed. Pitting the new phone against the HSPA version of the Galaxy S III and its a mixed bag on these scores. In day-to-day use, however, the Samsung quad-core phone offers a generally smoother experience, while we found the Xperia T would often stall during web sessions -- on both its own browser and Chrome. However, games and movies ran smoothly and streamed without issues, making the patch browser performance even more disappointing. The Xperia T is a deceptive phone, with a design that looks and feels narrower than it actually is. Despite that huge display, it falls within the same dimensions as smaller-screened smartphones, with Sony shedding at least some of those exaggerated borders. It lands favorably with Android Ice Cream Sandwich OS, something that was notably missing when the Xperia S landed. But, with a software update now readily available on that older phone (we refreshed the older phone with the latest software to compare in this review) it's difficult to pin any major improvements or innovations that the Xperia T brings to phone buyers. It's difficult to pin any major improvements or innovations that the Xperia T brings to phone buyers. We still carry a torch for Sony and its tech launches, but our attention is rightfully shifting to the competition. Having both the S and T models side by side, it looks like one is the prototype of the other and we're not even sure which came first. Onscreen buttons and a marginally higher-resolution camera are certainly improvements, but a fully-priced Xperia T is hard to recommend over the now-discounted Xperia S.